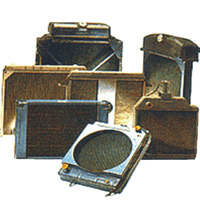 Heavy duty radiators for industrial engines used in compressors (200 CFM to 900 CFM), Cranes, Bulldozers, Dumpers, Diesel Generating Sets (5 HP to 1000HP), Loaders, Excavators of reputed organisations like Kirloskar Pneumatics, Indian Railways, Defense Units, Refineries, Automobile, Chemical Plants, Sugar Factories etc..
L-based, G-fin and wire wound fin). 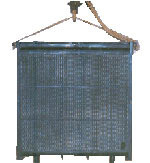 Air heaters ranging up to 375ºC, for textile and petrochemical units. 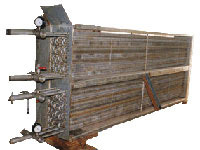 Air Cooled Intercoolers and After coolers: Intercoolers and After coolers Bundles for various Centrifugal Compressors with various designs. Capacity max up to 80,000 m3/hr.